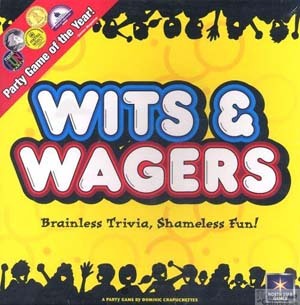 Wits & Wagers is a fast-paced party game with a unique combination of trivia, gambling, and social interaction. You're always involved in the action because everyone answers every question. Don't know the exact answer? It doesn't matter! Make your best guess. Then bet on the answer you think is closest to being correct, even if its not your own! That means you can win based on what you know or how well you know your friends. Big bets mean big payouts! Will you risk your chips on answers with high odds? Or save up for the dramatic All-In question? Wits & Wagers appeals to a wide variety of people. Some players will do well because they are good at trivia. Others will do well by focusing on the intricate strategy of the spreads between the answers, and the payout odds. But it's the people who know their friends best that are most likely to win at Wits & Wagers, because no one is smart enough to follow quantum physics, pop culture, history, and sports. Not even Einstein did that! Our friends at North Star Games have found the perfect balance between using your brains, and having fun with your family and friends! With Wits & Wagers, the 2nd game in the Eagle lineup designed by North Star Games, trivia has never been more exciting! The RDG Team hasn't gotten around to writing a review for Wits & Wagers. YET. We're writing up new reviews all the time. (And adding new games to review!) And this one is on the To Do List. But we could really use your help! If you'd like to say a word or two about Wits & Wagers, click here and we'll put it online! We're looking for more reviews and strategies for this trivia game. Submit yours here!